Here's all the recipes listed under Healthy Egg Dishes along with the comments posted by the breakfast lovers that submitted them. "Serve and expect applause! My secret ingredient is Campbell's Cheddar Cheese soup which works great in a lot of recipes." "My kid's #1 breakfast favorite. 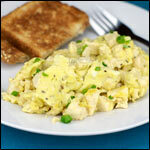 Sometimes I'll add a little crumbled turkey breakfast sausage to the scrambled eggs." "This burrito uses fat free cheese, egg beaters and low carb tortillas. It gets a rich meaty flavor from Bacos bacon flavor bits." "English muffins with American cheese and a ham and corn scramble. Great combination of flavors." 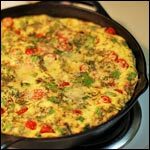 "A healthy, organic frittata that highlights corn and Pepper Jack cheese. Great for breakfast or any meal." "Whip up an Eggs Benedict-style dish quickly using deli-style ham and a sauce made from stuff that's probably in your refrigerator." 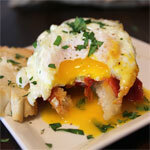 "A tasty bruschetta with a fried egg on top. Molto bene (means very good in Italian)!" "Perfect for breakfast or brunch. 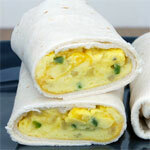 To make it super healthy, replace the eggs with egg beaters egg substitute and use canola oil instead of butter." "A Paleo-friendly, low-carb alternative to traditional breakfast burritos. 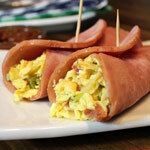 Slices of ham are used to replace the tortilla." "You can use all white bread for this recipe. But if you use all wheat bread, it doesn't work as well - it ends up tasting too rustic and doesn't look as nice." 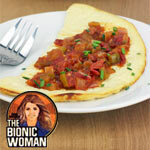 "A vegetarian, egg-free omelet from TV's The Bionic Woman. Tested by Mr Breakfast." "You can mass create individual portions by using a deep muffin tin. Low-carb friendly recipe." 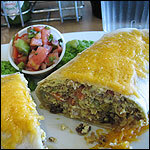 "Big Mexican flavor in a low-carb burrito. You can replace the Cheddar cheese with Pepper Jack or a combination of cheeses." "I make this about 3 times a week and love it. It's also good with a crumbled strip of veggie bacon." "This is an explosion of wonderful flavors in your mouth - with great texture as well. It's also low carb. Only 7 carbs!" 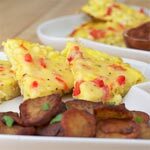 "The dish also works as a frittata if you don't scramble it. Just cook it on both sides until the egg is completely set." "Poached eggs over spinach and rice. If eaten with a side of fresh fruit you get a portion of most foods in the Food Pyramid." "A breakfast casserole with a lot of flavor. 420 calories per serving, 14.6 g fat (7 g sat)." "In this recipe, the tofu is actually not very noticeable... we like it because you get a bigger scramble with fewer eggs. The tarragon can be replaced with any nice herb blend." "Once I tried the steam fry method, I've never flipped an egg over easy since!" "You can customize this by adding pepper jack cheese and green chili for a southwestern flavor (excellent in a tortilla), or by adding veggies of your choice, and perhaps hot sauce in the eggy custard." "A puffy spinach and Swiss cheese frittata made with low-sodium cheese and cholesterol-free egg product. Secret ingredient: Cream Of Rice Cereal." 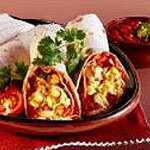 "Serve with sour cream, salsa, or guacamole if you like - makes an excellent dinner breakfast!" "This is also great with crumbled vegetarian (soy) chorizo if looking for a hearty breakfast serving." "This recipe tops Eggs Benedict with a fresh tasting pesto instead of the traditional Hollandaise sauce. Roasted tomato and eggplant also featured."